Stumbling across a Volga GAZ-M-21 in the metal will challenge even the most hardened car spotter to pigeon-hole it. It's much bigger than the 1958 Holden FC that it closely resembles, and it's actually longer, wider and higher than a Humber Super Snipe, but doesn't look it due to its all-road, high-rider stance. But there are even more peculiarities. It's powered by an overhead-valve four, except at 2.5 litres it is bigger than most sixes of its era, and with 85bhp (63kW), it has more grunt. It also has an aluminium block with iron wet-sleeve cylinder liners and five main bearings, a combination found only in smaller Peugeot or Renault engines. Despite familiar cues, the Volga is obviously not a product of 'The West', nor does it have the quaintness of similar-looking early Japanese cars. The featured car is a 1963 model, the second facelift and third series of a model that first went into mass production in 1957. 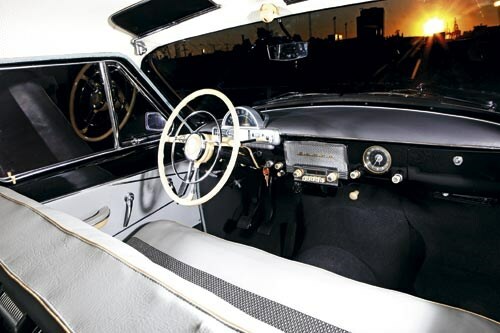 The same time line applied to Western models such as the Peugeot 403, Volvo 122, Borgward Isabella and Simca Vedette along with various Humbers, Rovers and Vanguards. The toothy grille, a development of the grille that appeared in the 1958 second series, prompted the nickname 'Akula', for shark. The name stuck, as even in 2012 the M-21 has quite a menacing presence. A closer inspection will reveal more robust construction than usual for 1957, with a body made of thick, almost plate steel. Even if the big Volga makes a salutary nod to unitary construction, its structure is bolstered by a massive half-chassis that supports the front-end, not unlike the HQ Holden. Detailing inside and out is not intended to win friends or generate a feel-good factor, and trim is there to finish it off - no more, no less. At this point, I am transported to a classroom in the early 1960s as an 11-year-old, listening to the one-time professor who had the thankless job of teaching me and my sullen mates. A Latvian academic who fled after the Russian takeover of his country, he was always good for a rise if you asked him to explain what was wrong with the Russians. His explanation remains hard-wired in my memory 45 years later and the sight of the Volga brought his words back with a jolt. "In Australia, if you want a yellow lolly, you buy a yellow lolly," he said. "If you want a green lolly, you buy a green lolly. If you want a red lolly, you buy a red lolly. In Russia, if you want a green or yellow lolly, you buy a red lolly. If you don't want a red lolly, you buy a red lolly…" At this point his face went redder. "In Russia, if you don't want the red lolly, you buy the red lolly, you eat the red lolly, you get sick of the red lolly, you still eat the red lolly." Russians had even less choice with cars. 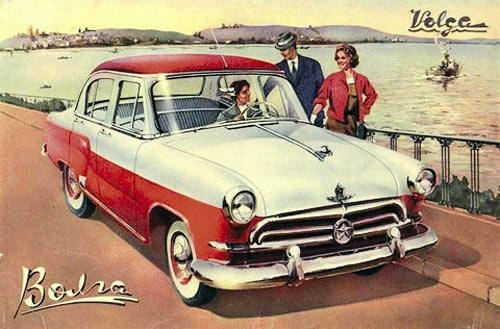 At a time when the average salary was 90 rubles (US$90) a month, the Volga cost about 6000, which might explain why car ownership was between one and two for every 100 adult Russians and why the Volga is such a paradox when its domestic value, specification and inaccessibility had no equivalent in a Western context. By 1963, the basic Australian wage was $1500 per year and the average worker had no problems earning $3-5000, which might explain why Holden sold 256,959 EHs at $2400, or eight times the Volga's sales rate. And Australia, still riding on the sheep's back, was by no means the wealthiest of economies in 1963. 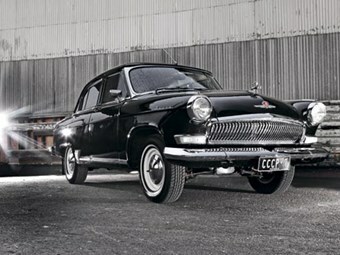 Yet the Volga was sold in the UK as a left-hand drive export during this period for about $2000 and was actually a Holden rival in markets such as Greece and Indonesia. Volgas, with extra chrome, were also shipped to Brussels, minus engines, where they were fitted with a variety of British and European diesels, then used as taxis in Belgium and Holland. If Russia hadn't been so desperate for hard currency, the West would never have seen one. For Russians, the huge expense of a Volga was not the only issue. In a system where some people were more equal than others, showing up with 6000 rubles to order a new Volga would not have gone unnoticed. One of the rewards for a good comrade was elevation up the waiting list but if you didn't satisfy that criteria, you could be in for an indefinite wait. When Yuri Gagarin was given a new Volga in 1961 for being the first human in space, he became a stand-alone citizen in more than one field of endeavour! Because the Volga also tended to be the kerb crawler of choice for the KGB (they also had an M-23 interceptor powered by the big V8 from the Chaika limo) to cleanse streets of unwanted dissidents, the arrival of a black Volga in your neighbourhood was intended to instill fear. It succeeded. The distortion of what the Volga initially represented paralleled the degeneration of Russian idealism into another petty, autocratic regime. 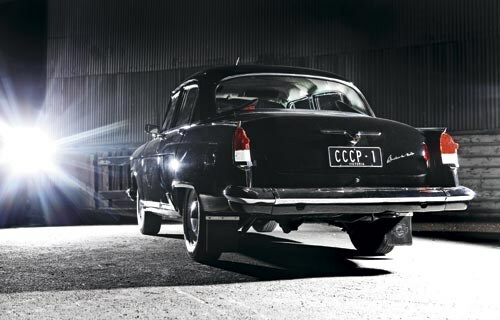 One internal source describes how the Russians imported three 1954 US entry models - a Plymouth Plaza, Ford Mainline (not the Aussie ute) and a base Chevrolet - then brazenly pictured each in Russian newspapers as cars that would soon be available to every-day Russians. It was not a totally fanciful scenario. 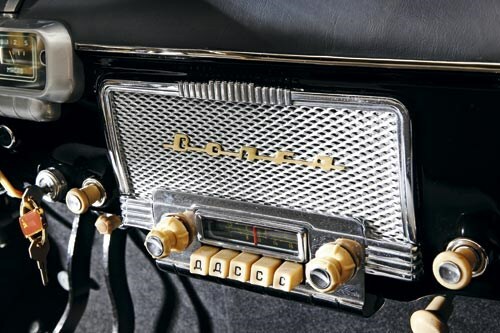 In 1929, Ford had entered an agreement with the Russians to recycle its obsolete Model A range between 1932 and 1936, just as Fiat did decades later with the Lada-badged 124. The Russian factory that resulted in 1933 was called Gorkovsky Avtomobilny Zavod, or GAZ. From 1936, each model gained an M prefix for Molotovets, an affirmation for good Russian comrade Molotov (in stark contrast with the deadly cocktails named in his honour). Experience with various Fords led to the unique GAZ M-20 Pobeda (Victory), built from 1946-58, with styling similar to the first Standard-Vanguard and Peugeot 203, which was quite advanced for 1946. Pre-production M-21s didn't surface until 1956, which might explain why the 1954 US cars were shown to Russians in the meantime. This would also explain why the first M-21 was powered by the old side-valve Pobeda engine, with looks based on the '54 US cars. By the time the M-21 entered mass production in 1957, GAZ's new overhead-valve four, which owed nothing to any 1954 US models, was ready. Because all European manufacturers were combining elements of trend-setting US styling with upgraded versions of their old engines during this 1948-55 period, there is nothing unusual about this, unless you were promoting a regime that was superior and trend-setting in all respects. In 1954, the Russians had correctly identified that the slab-sided Ford Mainline and Plymouth Plaza were the way of the future. The first M-21's windscreen, centre-spinner grille and body sides were inspired by a car Aussies knew as a 1954 Ford Customline, combined with taillights and rear pillars inspired by a model built locally as the Plymouth Cranbrook. 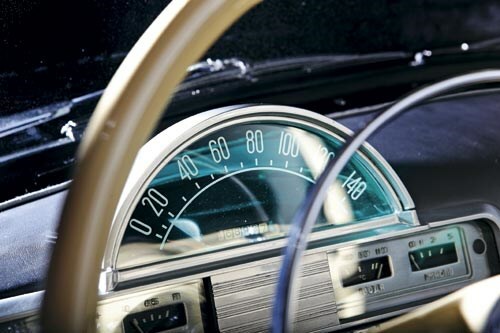 Only the semi-circle, back-lit speedo (soon to appear in the Ford Zephyr and Standard Vanguard) doesn't add up in our 1954 context, as this distinctive new US Ford feature didn't reach Aussie Fords until '55. The 1958 facelift, or second M-21 series, which involved little more than its new shark-toothed grille, showed clear links with the benchmark 1955 Chevrolet, something it shared with almost every family sedan globally, including Holden FE-FC models. The mild '62 facelift was more of the same and the Volga became a marker for a repressive, potentially hostile regime increasingly feared by the West. US road testers derided the Volga as a quaint equivalent to '30s US cars, an exaggeration that said more about political tensions than the Volga. British tests were far more objective and relevant to Australians. 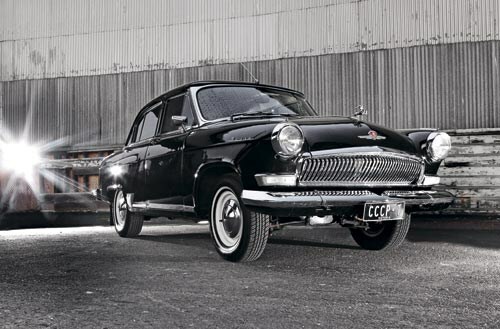 Following a spin in the featured car, it's clear that a Volga M-21, in a different political climate, would have been far more suitable for local conditions than most '50s British models. British tests in the '60s had to concede as much. After all, one of the Volga's primary applications was to maintain Russian tentacles around the clock in some of the most inhospitable regions on this earth. US tests conveniently overlooked that a budget '63 US car wouldn't have seen which way the Volga went. At 1460kg, it was heavy, with more of its weight over the rear wheels for sub-Arctic traction and lighter steering than expected. Ground clearance was around 200mm, helped by massive 6.70 x 15 high-profile crossplies. A 60-litre fuel tank gave a touring range of 700km - enough to penetrate Siberia if necessary. Most mechanical systems were easily dismantled with the massive tool kit for roadside repair once you got there. 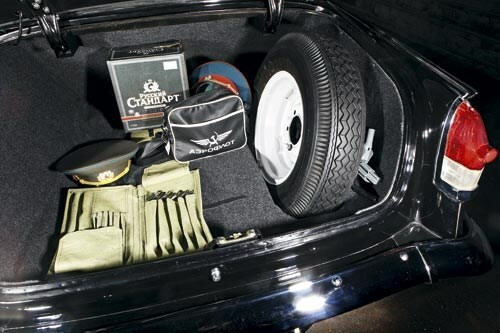 Although Americans dismissed it as too small and old hat, it was actually quite roomy, refined and comfortable when beefy KGB officials would not have tolerated it any other way. 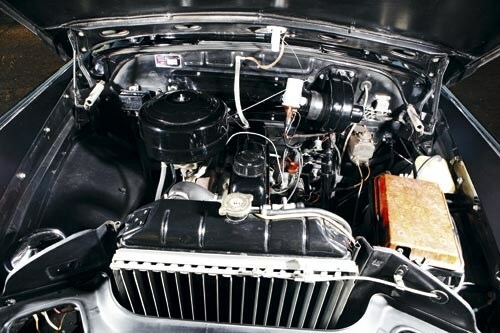 The big Volga four delivered the same power on export fuel as a late-model Mark II Zephyr Six, and power ranged from 70-85bhp (52-63kW) as ignition timing was easily tweaked for available fuels. With peak torque at 2200rpm and a compression ratio of just 6.6:1, it only needed a three-on-the-tree manual with no synchro on first. On the road, this 1963 Volga feels more like a heftier, higher and wider FC Holden than the low-riding XL Falcon or AP5 Valiant of that year. In 1965, the Molotov prefix was relegated and the Volga became the GAZ-21, a model still relevant enough to stay in production until 1970. As a more stylish and comfortable alternative to a Jeep or Land Rover for all weathers and roads, it had few peers until the Range Rover arrived later in the same year, highlighting the growing chasm between the East and West. Lembit Marder fits the profile of so many Eastern Europeans across the world revisiting the Volga. Born of Estonian parents in Australia, since 1983 he was regularly sent back as a young man to visit his Estonian relatives. As with most Western visitors, he was picked up by the KGB from the airport in a black Volga and taken straight to his family. It was a ritual that left such an impression that he bought his first 1963 Volga, a grey one, in Estonia in 2009 and had it shipped to Australia. 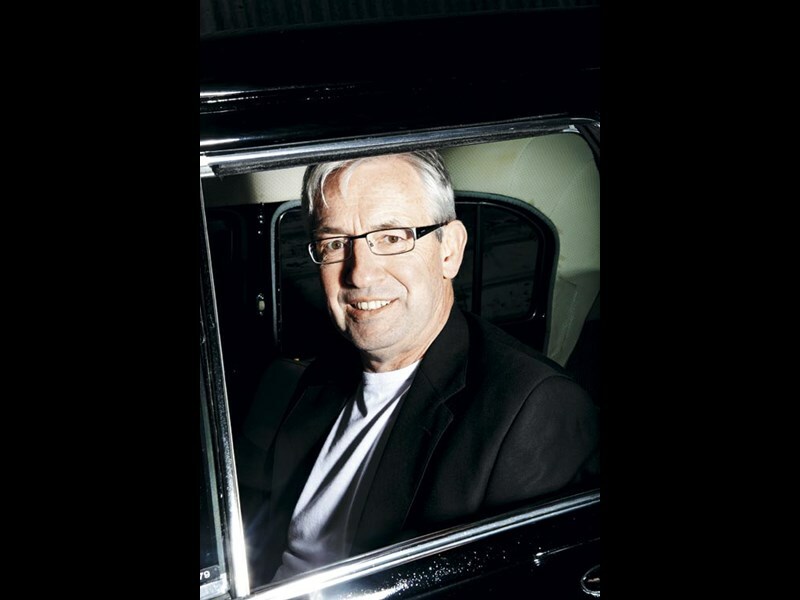 Not long after it arrived, an even better black example came up for sale and Lembit headed straight to Estonia in January 2010 to finalise its purchase and safe delivery. As featured in these pages, it only needed minor work to bring it to top condition. The grey one was then sold locally to make way for the black one. Both left little change out of $25,000, each. Lembit fits modern whitewall radials to make it safe in today's traffic but swaps them for the original tall 1940s-style crossplies for rallies and displays. He also has quite a collection of Russian uniforms and items that a KGB team would have typically housed in the car on assignment. Lembit and his sister, with their Eastern European looks and dressed in period Russian uniforms, provide a glimpse of how intimidating such a combination could make a black Volga - enough to make it a finalist in the most recent Bay to Birdwood rally. And the CCCP number plate? It says USSR in the Cyrillic alphabet.